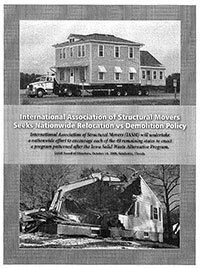 Widest Structure Move, Longest Building Move & Heaviest Building Move in North America. A family-run business, Warkentin Building Movers began in Virden, Manitoba back in 1972 with Herb Warkentin at the helm. Today, Herb's son Wayne handles the company from his headquarters at Thorsby, Alberta - just southwest of Edmonton. Warkentin Building Movers moves everything from new 'Ready to move' (RTM) and modulars to historical buildings, barns, existing/older homes, sheds, re-locatable classrooms and all types of buildings in between. 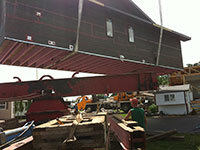 WBM lifts buildings, straightens barns and specializes in re-using buildings. Every move is unique and every building is a project unlike any other. Cost is determined by the condition of a given building as well as the existing and new site circumstances. 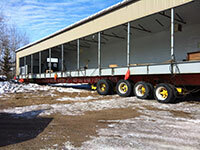 Warkentin Building Movers prides itself in being an environmentally friendly business. "Following the Manitoba Flood of 1997, Warkentin Building Movers was integral in the relocation and reconstruction of 30 homes in the Manitoba Flood Zone." "Moving North America forward since 1972"